While certainly everyone is entitled to their own opinion on a given place, there are statements which are true quite independently of personal beliefs. 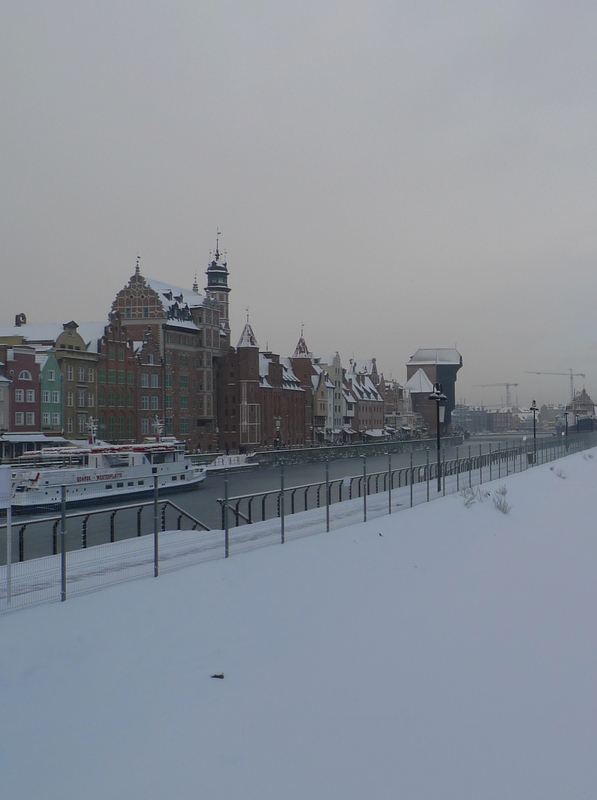 You could describe Gdańsk in lots of ways, and for sure you could love it just as well as you could despise it, but no one in their right mind could call Gdańsk a boring city. 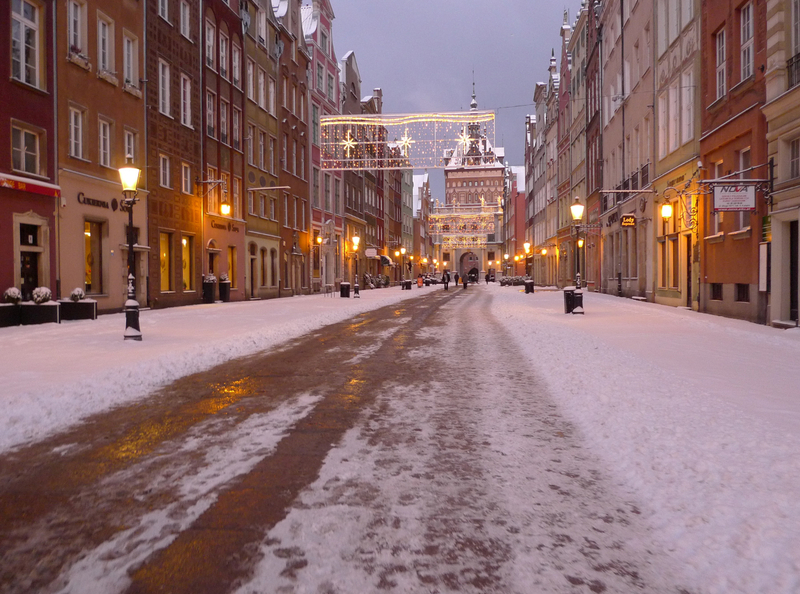 Throughout its over 1000-year-long history, Gdańsk changed its rulers 13 times – situated at the shore of the Baltic Sea as well as near the delta of the Vistula river, it quickly became a thriving trading center and a dream conquest for one or two greedy monarchs. 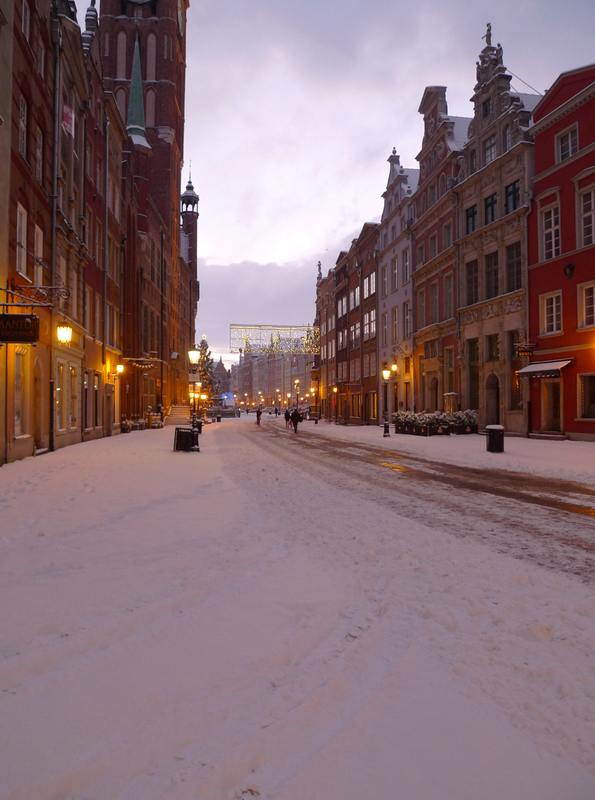 After a short period of having the status of a free city in years 1920-1939, Gdańsk was the first city to be attacked by the Nazi Germany on September 1st 1939, marking the beginning of the World War II. In 1980s, it was the birthplace of the Solidarity movement, which ultimately lead to the end of the Communist rule over Poland and across Central Europe. It is beyond doubt that the world as we know it today was in part shaped within the limits of this city. It is an inspiring thought! Every December, during our annual visit to Poland, my boyfriend Andy (whom you have already encountered before in form of the enigmatic ‘we’ used here on the blog from time to time) and I take a few days off – you would be surprised just how much time and energy one needs to put into all the family meetings, not to mention hanging out with friends, Holidays etc. – and head out for a mini vacation. Last year we spent a couple of days in a skiing resort (where I amazingly managed not to ski at all), so this year we hopped on a train that would take us to the sea shore. Now, the train ride itself is worth mentioning. Through Andy’s stroke of genius we bought tickets for a sleeping car. We would board the train at 9 p.m. at the foot of the mountains in Jelenia Góra (about 200 m from this place, actually) and arrive in Gdańsk at 7 a.m. the next day – what an adventure! It might seem childish, but in an age when we travel thousands of miles within hours, it feels really good to put an old meaning to the notion of distance. And this train ride provided just that: we lay on the bunks in our compartment with the lights off, glasses of wine in our hands (it was a BYOB kind of party), and we just looked outside the window on the ever-passing-by night landscape. 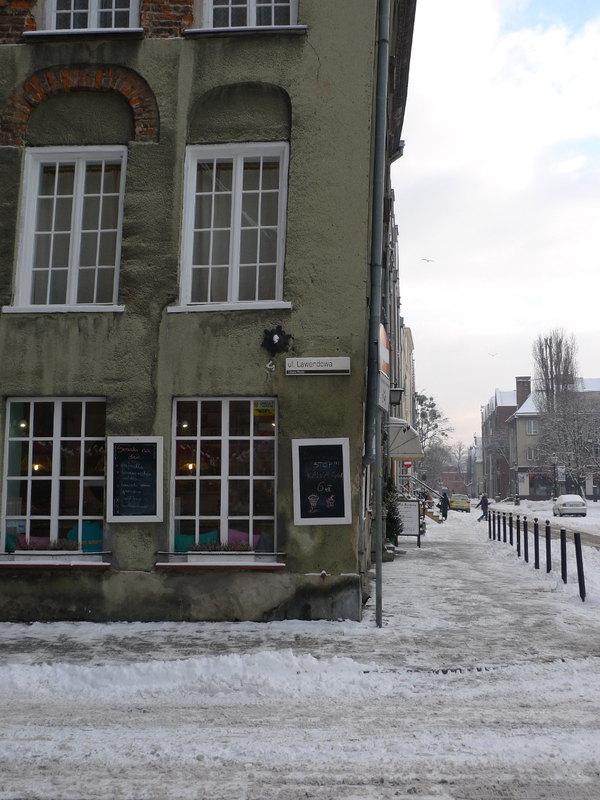 We saw woods covered in heaps of snow, we saw the city of Wałbrzych deep asleep, and from quite impressive embankments we looked across snowy planes dotted with a few houses here and there. 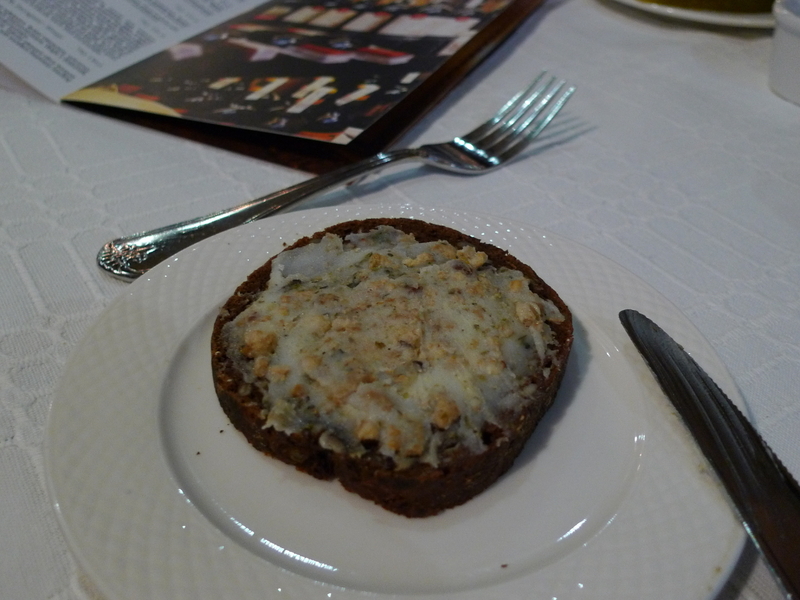 It was absolutely delightful! Admittedly, we arrived really early, so after leaving our baggage at the hotel we had to wait even for the first restaurants to open. With no other options at hand, we spent about an hour just wandering around the city center. 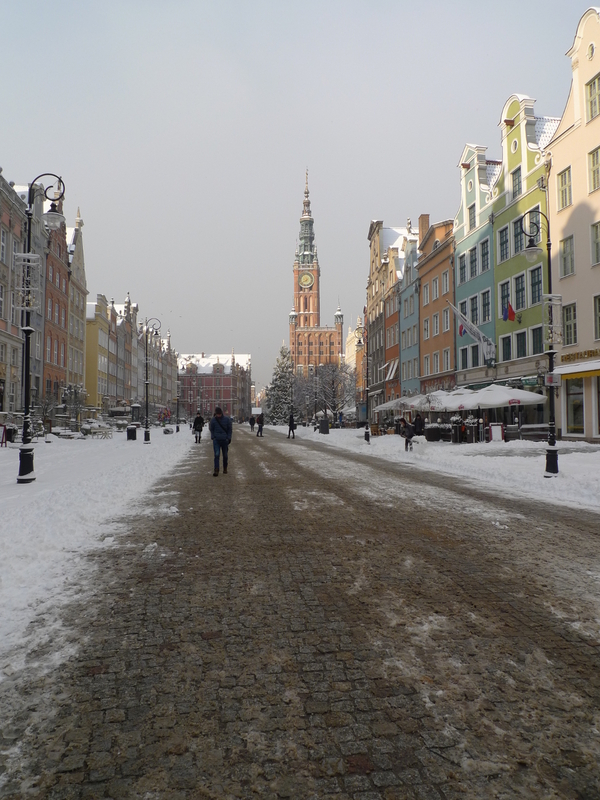 One can notice from the first sight that Gdańsk has been wealthy for centuries (that’s trade for you!). The architecture is stunning, and literally around every corner there awaits yet another construction marvel. As if that wasn’t enough, the Christmas lights were still around, the snow contributed to the winter wonderland atmosphere, and the peace of the early morning lend some magic to the otherwise busy downtown. It was more than beautiful. However, it was terribly cold as well! After a solid time out on a freezing morning I had no doubts that the only remedy for the piercing cold would be to have a breakfast of fried eggs and hot tea laced with rum. Let me tell you: it worked wonders! 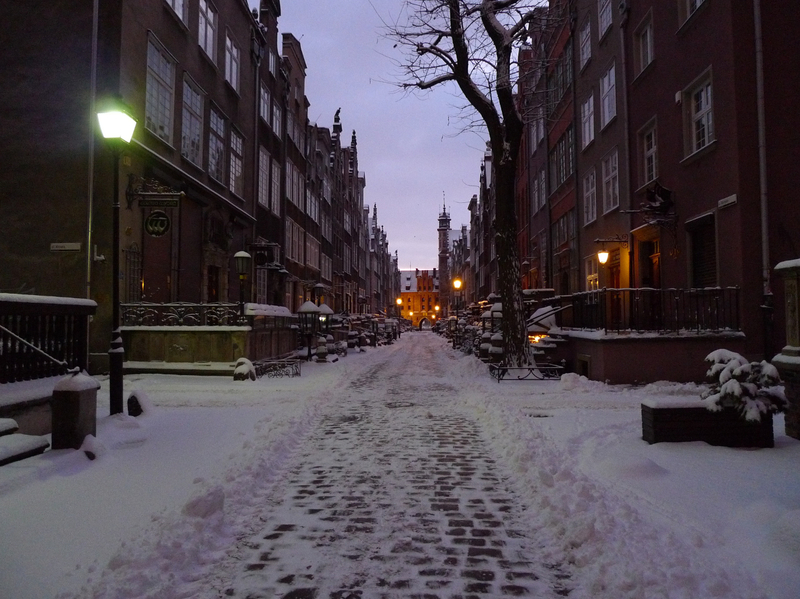 And as the following days remained just as cold, I spent my visit in Gdańsk sipping rum-laced tea, mulled wine and hot beer. Well – if this is not vacation, I really don’t know what is. The otherworldly building you can see in the above picture looks as if it could be anything from the main residence of the king’s daughter to a wicked candy factory, but in fact it used to be the great armory of Gdańsk, founded because of the ever-rising threat of Swedish attack. 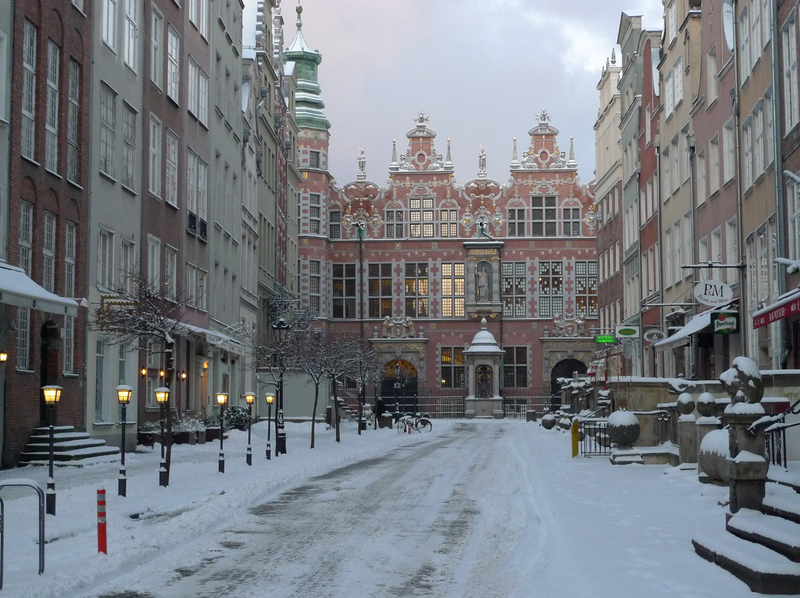 It’s been built in the first years of the XVII century based on the project of one of the most prominent architects of Gdańsk in that era, Anthonis van Obbergen, and all the stunning details are a great example of mannerism. 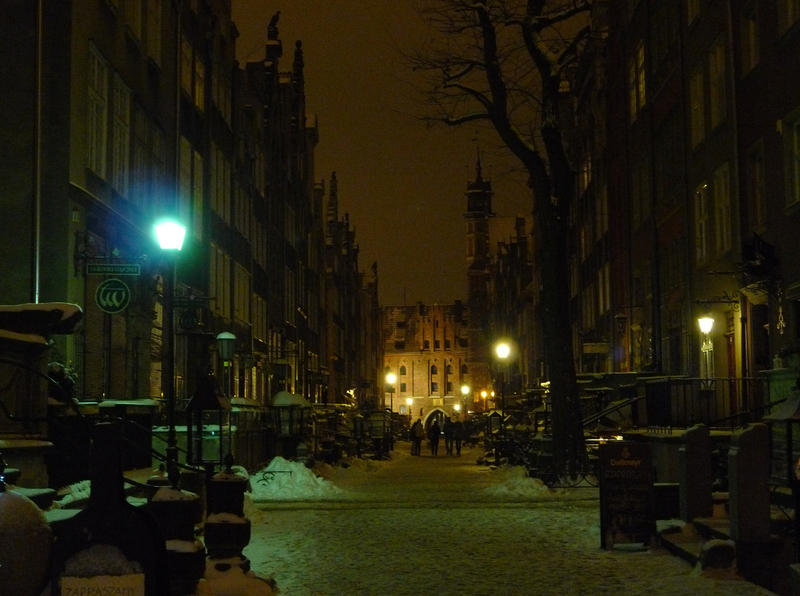 The so-called Long Market, i.e., the main market square. At the end of this alley you can see St. Mary’s Church – or, rather, a part of it. It is the largest brick church in the world, and one of the largest brick Gothic buildings in Europe, including castles – quite impressive when you consider that its construction began in 1379. 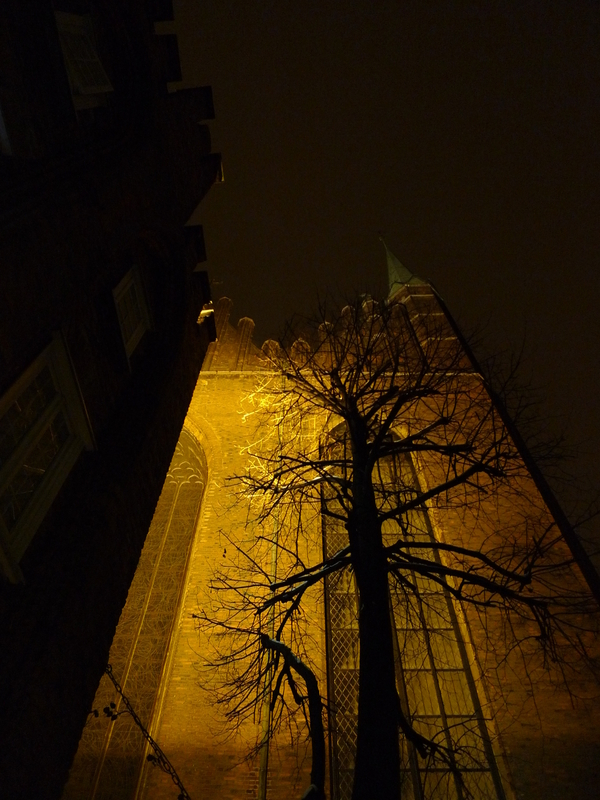 The architect, Heinrich Ungeradin, based the construction on the St. Mary’s Church in Lübeck. 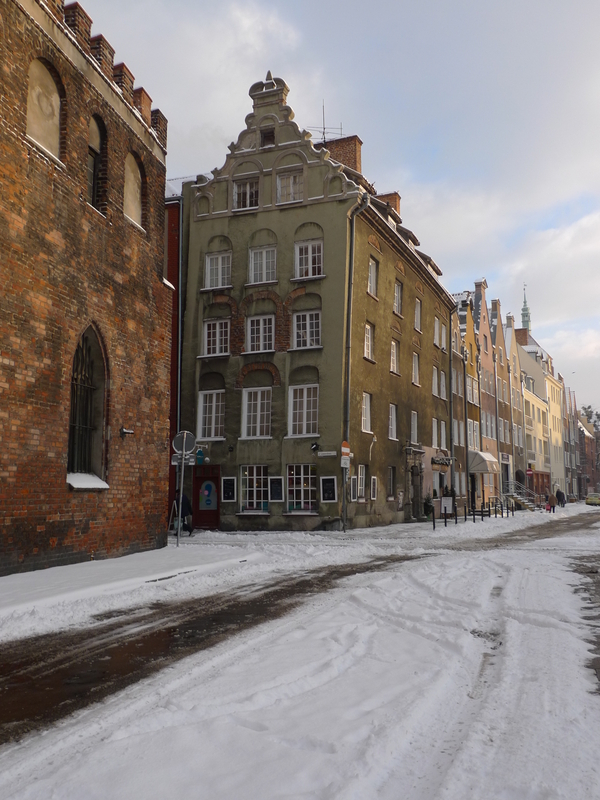 Next to the church, on the corner of the Mariacka street, stands what is claimed to be the oldest house in Gdańsk – a likely claim, as it was built in 1451. 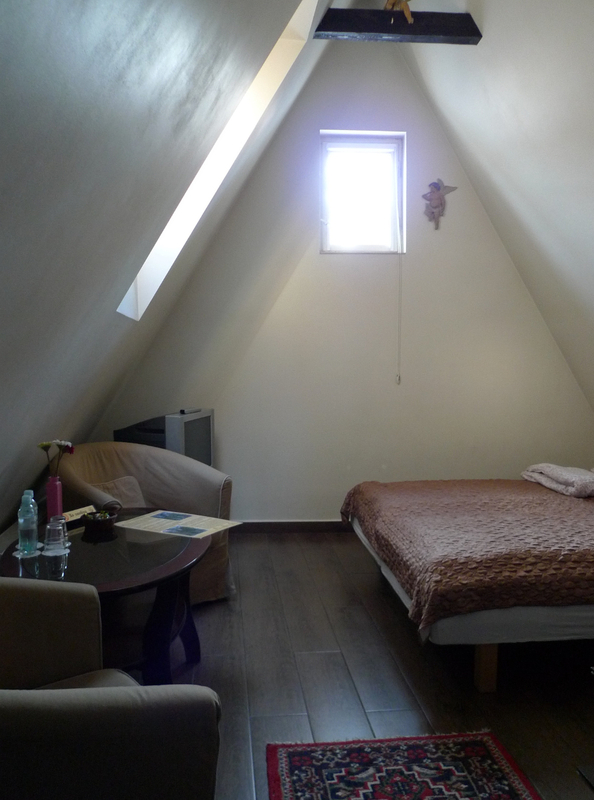 But this is more than a mere tourist attraction – it actually is a guesthouse! For years now, Andy has been known to be a master of booking the best hotels, and yet he still outdid all my expectations. 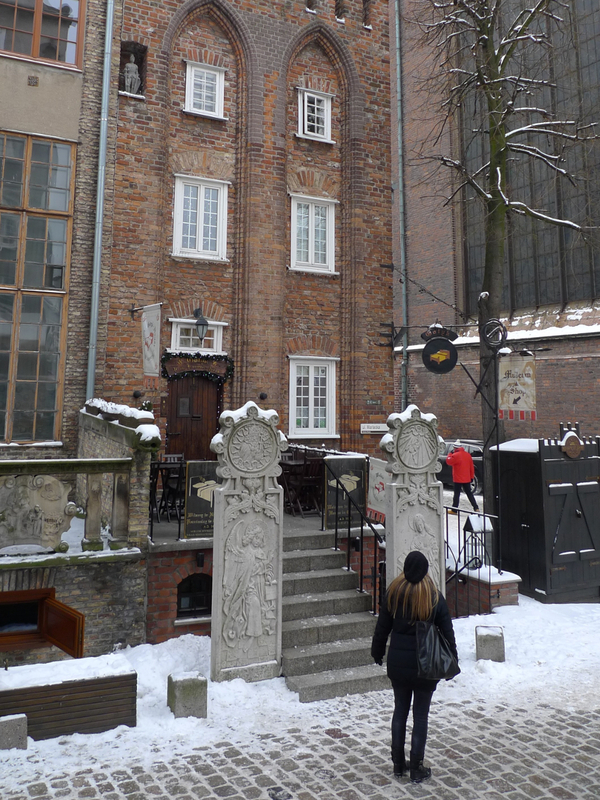 We got to stay in this beautiful house, commercially known as Gotyk House, right in the very center of Gdańsk and a few steps from its great monuments. It was a great choice! The rooms inside are modest, which for me actually adds to the charm – it would be hardly fitting to style the interiors in accordance to the latest design trends. The staff was friendly but discrete, we could reach most of our destinations with just a couple of minutes of brisk walking, and altogether it was fantastic. If you’re wondering what’s dangling so adorably underneath the ceiling, you can take a better look here. Apart from the monumental churches and city halls, I find the city’s most charming feature to be its hundreds of civic buildings: with all their beautiful details and sometimes quirky shapes they truly seem to be the most magical contribution to the overall spell. Can you imagine living in one of those? 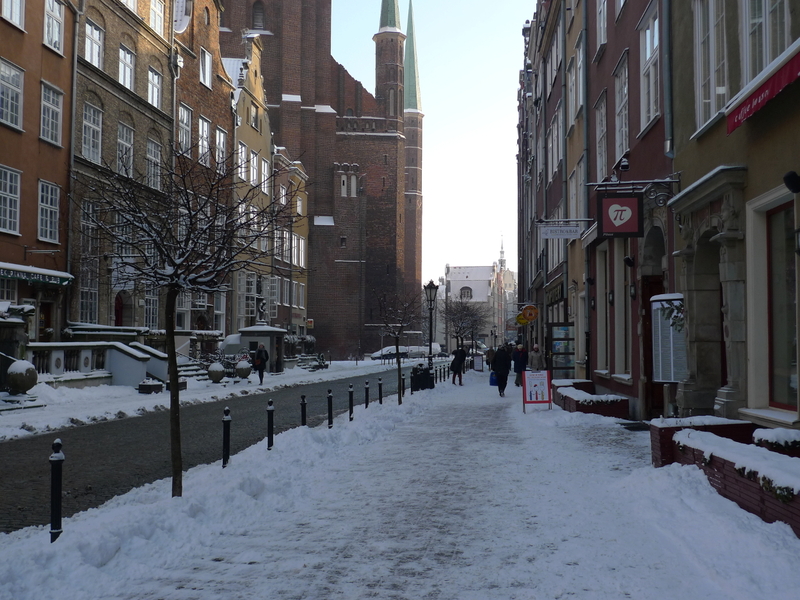 Piwna street and St. Mary’s church in the back. 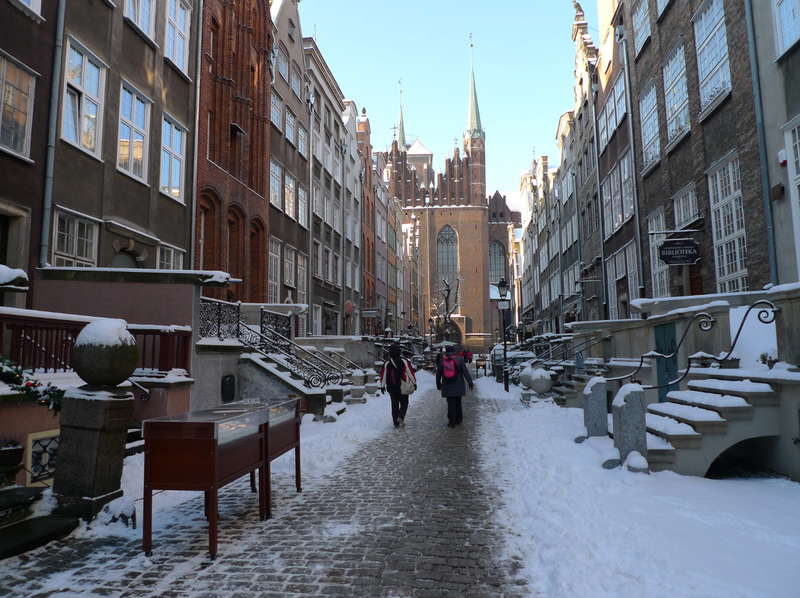 Kaletnicza street and St. Mary’s church again. 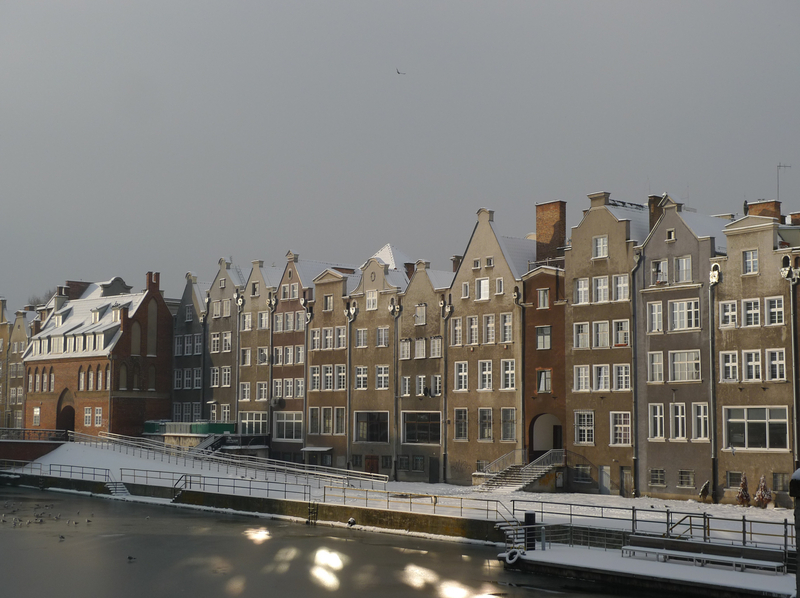 One of the unusual attraction of Gdańsk is the so-called ‘leaning building’. Though admittedly not quite comparable to the famous Tower of Pisa, it is still interesting to find that the cause of the leaning is not bad construction, but highly unfavorable soil on which the house was built. 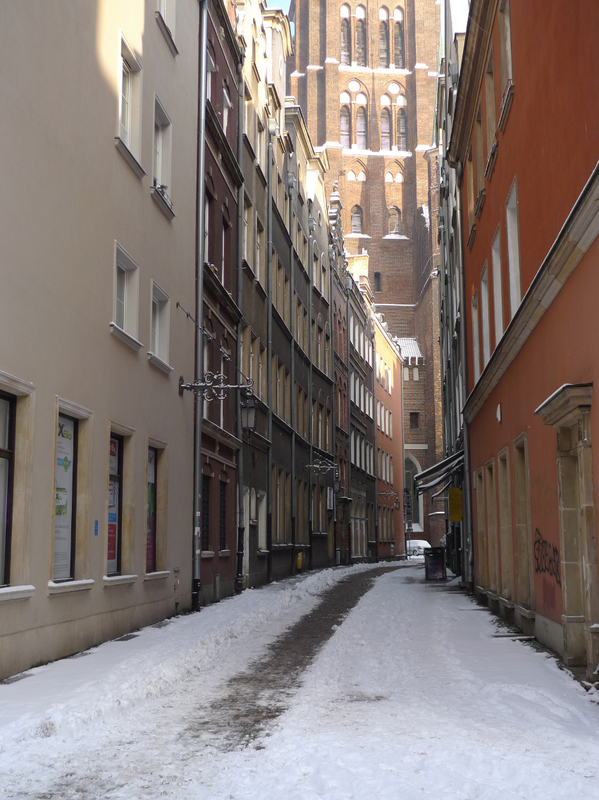 The building was even deemed for demolition in the 1950s, but luckily a group of architects, managing the conservation of historic buildings on a daily basis, saved it in return for being able to use its apartments – which would easily raise some interest in just about anybody, and was especially handy for the group in question as most historic buildings in Gdańsk are located nearby. The outline of the whole rescue action was to introduce a reinforced concrete staircase along with a series of steel tie-beams, which stopped the building from leaning any further. In 2015, we can with all certainty say that the rescue was indeed successful and the building is secure, even though the deviation is still easily seen and the whole thing has a precarious feel to it. 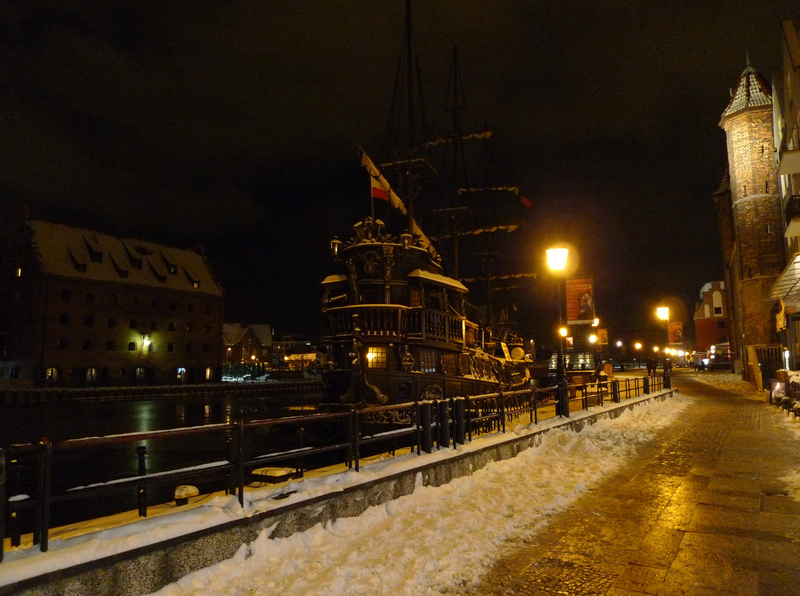 And lastly, visiting Gdańsk could not be complete without witnessing its most prominent features: harbors and ships. One cannot stress hard enough that the whole city would look entirely different if it wasn’t for its centuries-long connections to trade and transport. Here you can see ships docked on the Motława river. The dark monument you can see in the above picture is the medieval Great Crane at the old gateway to the port. The lifting appliance inside consisted of connected wheels and was set in motion by men treading on the wooden steps inside the circumference of the wheels. A rope wounding round on a roller would then be used to either raise cargo from the ships or set mast on sea-going Vistula ships. Great in its simplicity, the crane was able to lift up to 2000 kg. As almost every other old structure in Poland, the Great Crane was badly damaged during the World War II. 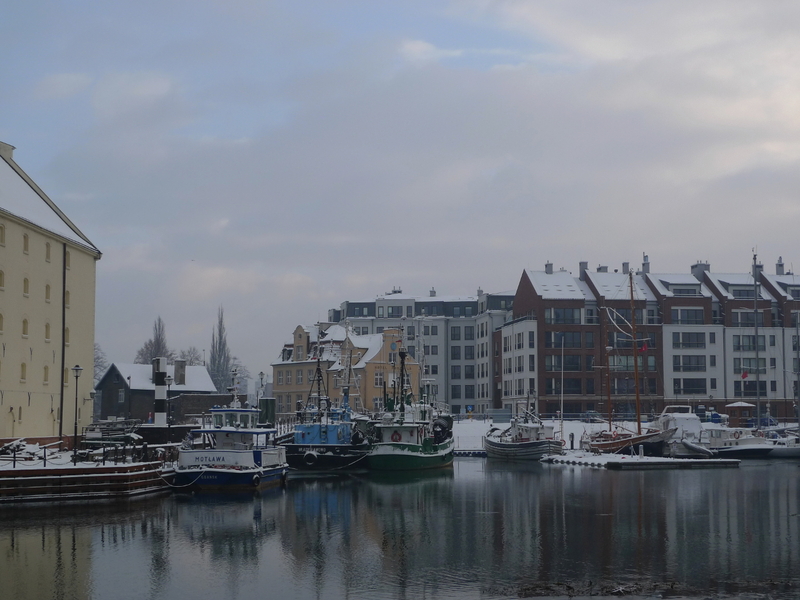 It’s been rebuilt in 1962 and as of today is one of the few reconstructed relics of medieval port technology, and the oldest surviving port crane in Europe. 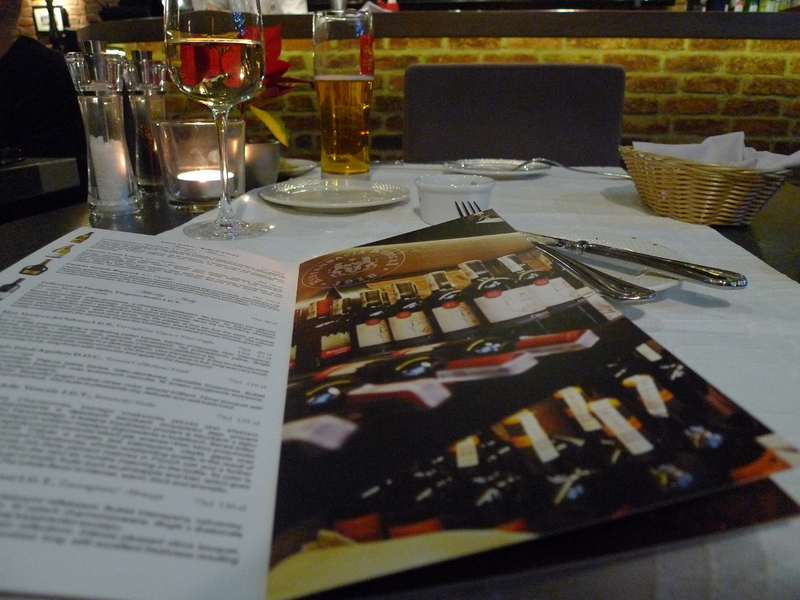 After a day spent on wandering about, freezing and drinking various suspiciously alcoholic beverages, in the evening we decided on a short walk along the river and a dinner in one of the restaurants at the riverside. We were very fond of the place we chose. 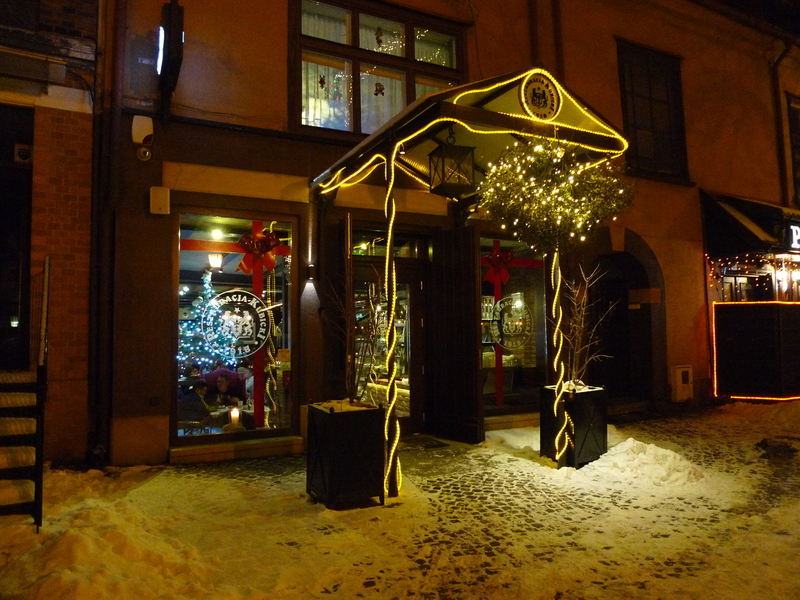 Restauracja Kubicki is the oldest restaurant in Gdańsk: it was founded in 1918 by Bronisław Kubicki and quickly became a very popular place to be during the interwar period. 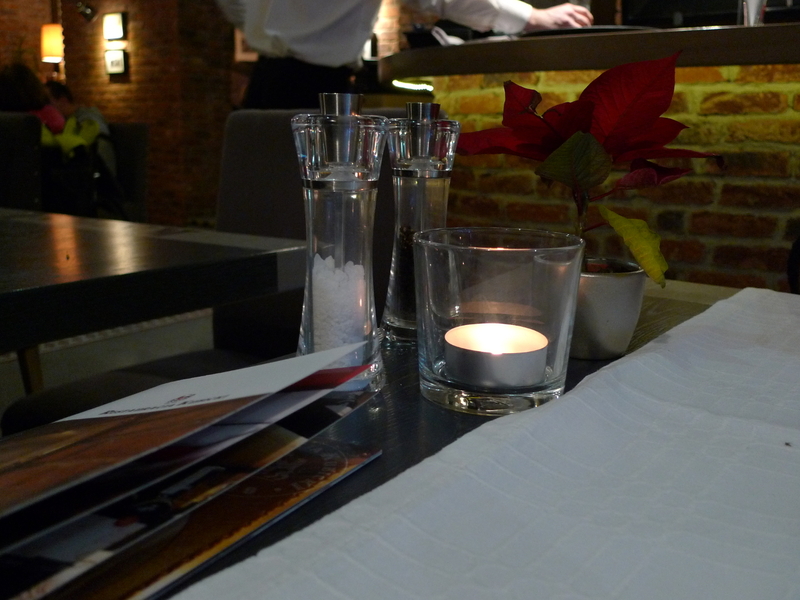 However, after the war the restaurant steadily fell into decline. In recent years there appeared a new owner, and he seems to put every effort into recreating the old glory of this place. Apparently he even managed to find the old cook from the restaurant, already 86 years old at the time, and obtain from him an original recipe for pork knuckles. If this is true, then his dedication is indeed praiseworthy! We enjoyed ourselves greatly, although – big children that we are – the essential part of our fun was caused by the wine list. Have you ever tried to read wine descriptions? They’re hilarious. I know this all is just specific jargon, but how can one write down things like ‘finishing with rustic yet velvet tannins’, ‘well-rounded in the mouth, medium bodied with a touch of chalk’ or ‘candied figs on the nose’ with a straight face? 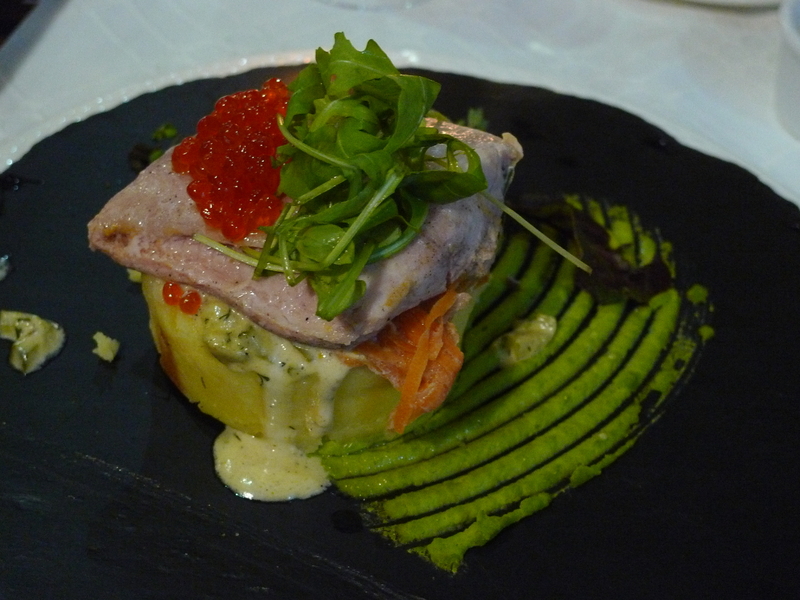 The cuisine was truly great though. 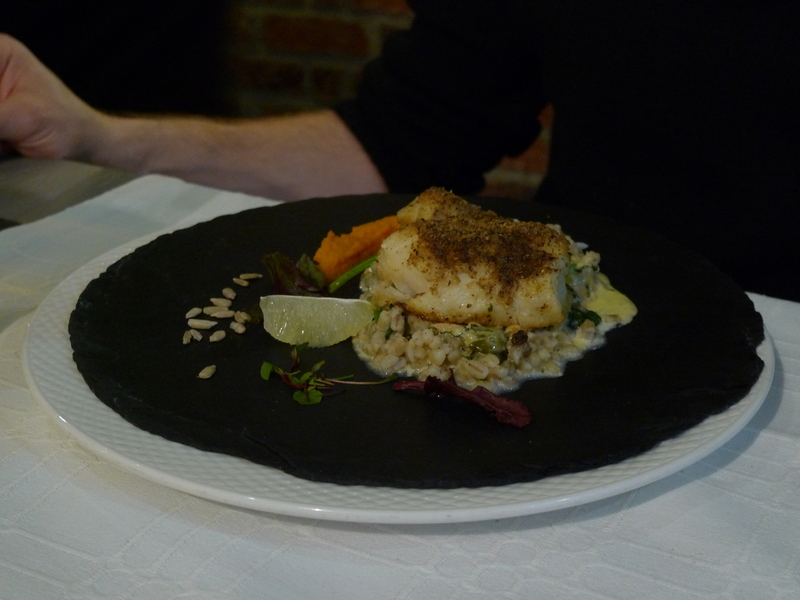 We were set on trying some fish (where else if not at the sea shore? 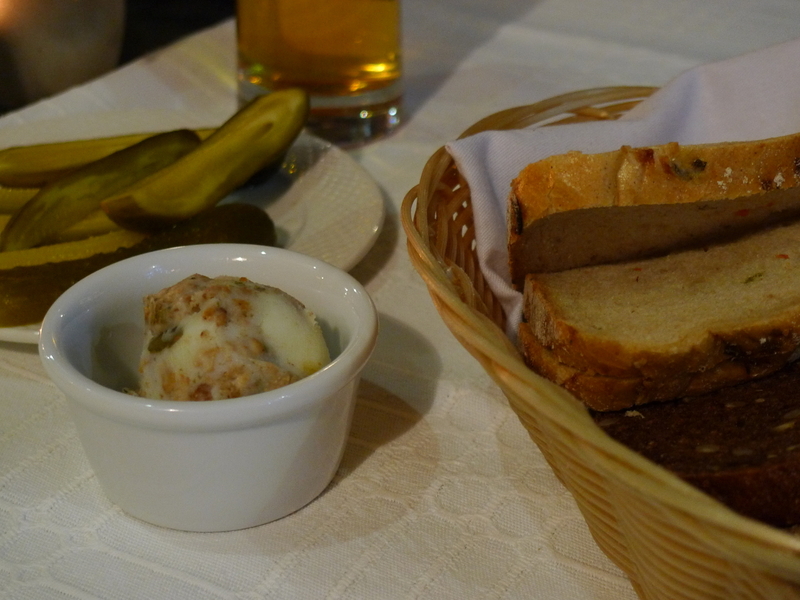 ), so we ate some bread with smalec (please don’t be fooled by the English Wikipedia – smalec is not lard) as an appetizer, and then I ate a delicious catfish dish, while Andy had some fried cod, which was just as fantastic. It was a long day, wasn’t it? In our usual manner, we didn’t really visit any particular sightseeing essentials, but instead we wandered around and discovered more about anything that caught our interest at the moment. 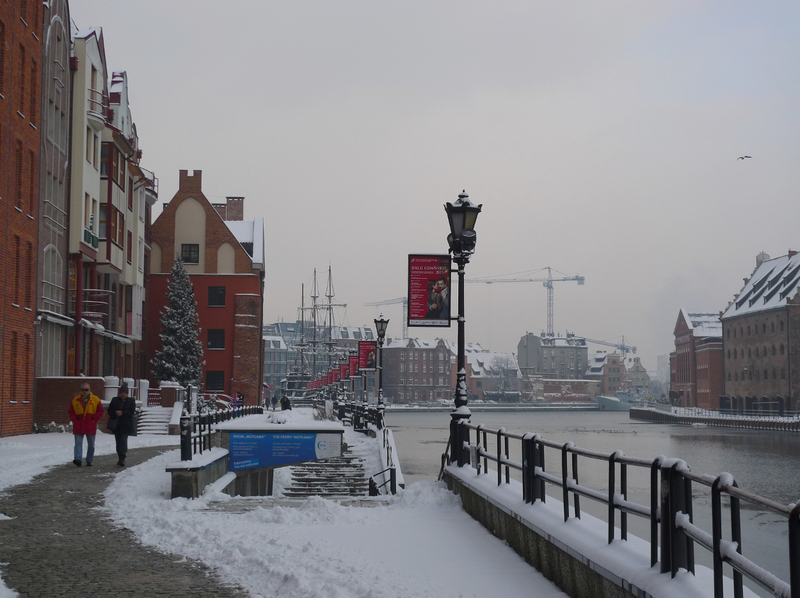 We enjoyed ourselves greatly, and for sure Gdańsk itself was a big part of it, though I can’t help but to repeat the old cliché that good times are those spent in good company. For all I know, if Andy and I spent the whole day in my backyard instead we would have loads of fun as well. 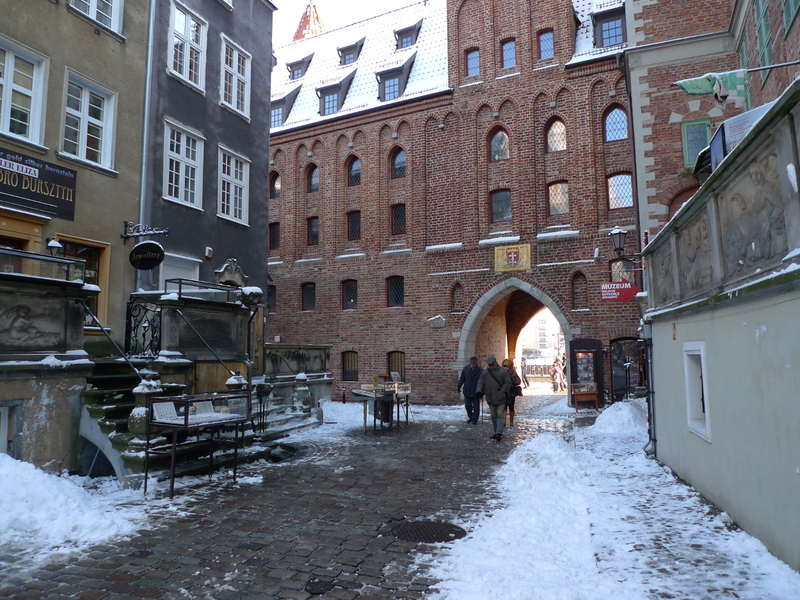 Still, we didn’t – we managed to get a couple of days out of the usual hectic December whirl and spend them in one of the prettiest and most fascinating cities in Poland. Life is good! Just before entering the door to our guest house, I took a moment to look at St. Mary’s church (or, again, the part of St. Mary’s church that was visible from that point). With this perspective at hand I am beyond words. 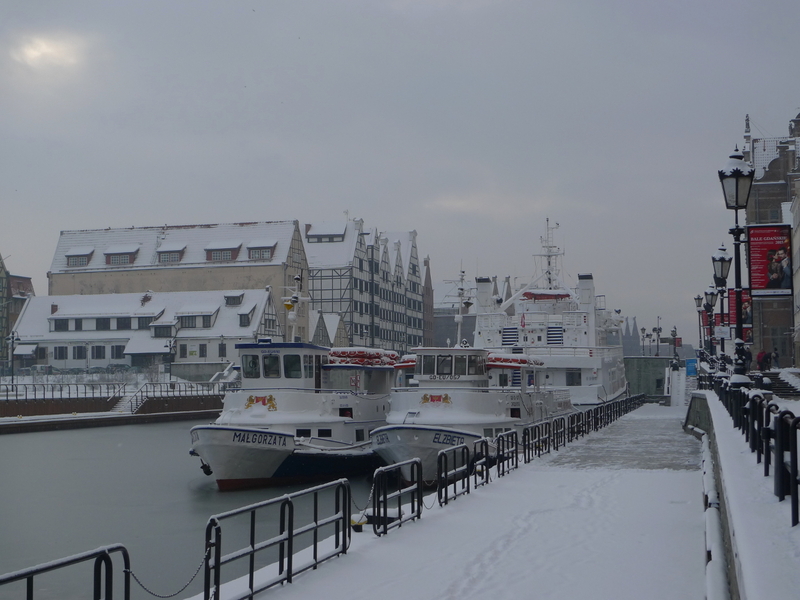 This entry was posted in Baltic Sea, Food, Gdańsk, Harbor, Poland, Restauracja Kubicki, Sea, Ships, Snow, Travel, Winter, Winter Wonderland, World War II and tagged Baltic Sea, Food, Gdańsk, Harbor, Poland, Restauracja Kubicki, Sea, Ships, Snow, Travel, Winter, Winter Wonderland, World War II. Bookmark the permalink. ‘stumbled here while looking for info on port city of Ceiplice(sp?). ‘dont know if 1 of you is a professional or not , but your photos are as good/better than hundreds and hundreds of pics I’ve seen of europe. my mother’s family emigrated from Cieplice(sp?) in the 1890’s . thanks for, as my artistic daughter would say, professional photos! Thank you for your lovely words! Neither of us is a professional, and the pictures above are just a result of a very strong selection out of hundreds of photos – I guess the era of digital photography can make a good photographer out of virtually anyone :). I spent the first 19 years of my life in Cieplice – it is a magical place, surrounded by the mountains (they are always on the horizon, in whichever direction one looks), and for me it’s one of the most poetical places in the world. No doubt I am not objective in this opinion though!